This huge coal preparation plant is part of the Beringen mining site, a large former coal mine in the Flemish province of Limburg (Belgium). The coal mine is an important example of the large-scale developments in coal extraction in Europe and the rest of the world in the 20th century. The construction of this large coal preparation plant started in 1923-1924 (coal preparation plant 1) and this first part was later expanded with coal washers 2,3 and 4. The four parts together form one massive building in iron, steel, brick and glass, which not only dominates the mine site but also the surrounding area. The entire coal mine of Beringen, including the four parts of the coal preparation plant, was legally protected as a monument by the Flemish Government in 1993 and 1994. In 2009, the redevelopment of the mine was assigned to PPP company, with the main partner being LRM for 50% (the Limburg Reconversion Company – a company set up and controlled by the Flemish Government) together with a number of construction and real estate companies. They concluded that the maintenance of the complete coal preparation plant would not be possible and decided – without a thorough study of the building history – on the imminent demolition of coal preparation plants 1 and 3. On the site of coal preparation plant I a car parking would be developed. One of the arguements for the demolition are the costs of maintenance and the lack of subsidies. However, the Flemish Government being 100% owner of LRM, this means that subsidizing the PPS company BE-Mine means that the Flemish Government is subsidizing itself for at least 50%. Being aware of the danger a dossier of the coal preparation plant of Beringen was sent in for the 2018 ‘The 7 Most Endangered‘ programme. This is a campaign of Europa Nostra, the leading heritage organization in Europe, the European Investment Bank Institute, supported by the Creative Culture program of the European Commission. On January 16th it was announced that the coal preparation plant at the Beringen coal mine was selected by an international panel of experts to be one of the 12 heritage sites on the shortlist – and thus was considered one of the most endangered and most important heritage sites in Europe. Just before the summer break of 2017, the PPS company BE-Mine had applied for a demolition permit for coal preparation plant n° 1. It was also announced that once this coal preparation plant n°1 had been demolished, the procedure to demolish plant n° 3 would be started. While the plant was mentioned as one ofthe 12 most important endangered sites, withouth the legal protection of the building being lifted, a demolishing permit was granted in mid March 2018. After a procedure filed by the Flemish Association for Industrial Archeology, together with local associations, the permit was suspended by the Court. In order to circumvent this ruling, the strategy now is is to remove at first the protected status, and then grant a demolishing permit again and as soon as possible. The demolition of a large part of this legally protected building ignores the importance of the integrity of a historic building. 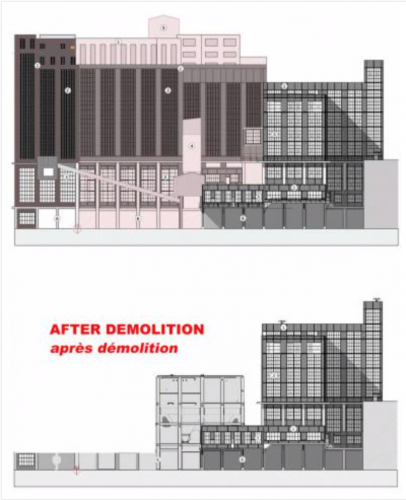 The demolition of the first part could create a dangerous precedent for further damage and destruction, leading to the loss of the value of the entire plant. It will also create a dangerous precedent for other protected buildings in Flanders, if one is permitted to demolish part of a historic monument without obeying to the legally prescribed procedures. The Flemish Advisory Commission for the Architectural Heritage (‘Vlaamse Commissie Onroerend Erfgoed) formulated last year in September a strong and well motivated negative advise for lifting the protection of the building. However, apparently this is not taken into consideration by the Minister in charge, who started mid December the procedure to unprotect the coal preparation plant. For the lifting of a protection, according to the Flemish historic buildings legislation, a public inquiry is required. Every citizen and association, without any restriction, from Flanders or abroad – can file a notice of objection and indicate that he / she is opposed to the abolition of the protection and against the demolition of parts of the coal washing plant of Beringen.